Starting with the unstructured data in California's legislation, it takes many steps to add structure to a single Section. Or rather, to add back in the metadata that the Section's original drafters intended, to help a reader understand and navigate the law. The next step is to apply the transformations to all of the Sections in the law. California helpfully makes all of its codes available for FTP download in a set of nested folders. It would be great if more government agencies made their data available in bulk. But we still have a problem: How to recursively iterate through all the files and folders in the directory (29 folders, 50,000 files sections in total) and apply the parsing transformations to each file. Each file consists of a (variable) number of sections, e.g. here. For this task, I went back to another old Linux utility: Find. If you type "Find /" from a command prompt in Linux (also MacOS), you get a list of all of the files and folders on your computer. Don't do this. It will take a long time, and is not really useful for anything. But you can use this powerful command within a single directory, and send the list of file names to a program that will operate on each one. In this case, I wrapped this all in a Python program, using the POpen() function to run any Linux commands that I wanted. Gory details below the fold. If you want to skip the details and go straight to the results, I've put the newly transformed California code sections on a website (calaw.tabulaw.com). Currently, the design is very simple and has no styling, whatsoever. But I welcome you to do a before and after comparison and let me know what you think in the comments. In my view, converting CA Legislation to structured data makes navigating the code much easier. It also reveals some problems with the version on California's website-- repeated sections, stray text markings--that should probably be cleaned up. More about these anomalies, and the brave new world that structured data can bring to law, in future posts. 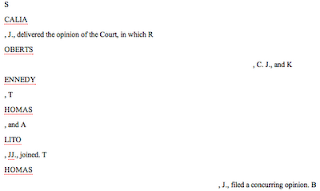 To convert CA statutes from text to html, I used the txt2html module, written in Perl by Kathryn Anderson. 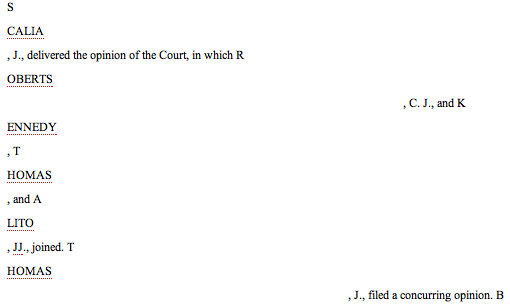 This was step 1 in the 5-step process I used to reintroduce metadata to the statutes. While there are a number of free online text to html converters, and some commercial packages you can download, txt2html is a fast, flexible and accurate open source option. It also works from the command-line, so I could combine it with the next steps I needed, to identify section headings, etc. What does this do? The "/path/to/file" needs to be substituted with the actual path to the text file you want to convert and "/path/to/file.html" is the name and path of the new document you want to create. One of the advantages of this module for converting to html, is that it has a good assortment of options. I found that the ones above were needed in order to keep the structure of the text file in place. For example, without these options, some of the subdivisions of a statute got collapsed with earlier subdivisions into the same paragraph. This did everything I wanted, and nothing I didn't. Installation instructions after the fold. In a previous post, I mentioned some of the challenges in recovering meaningful structural information (titles, paragraphs) from pdfs, and why government entities should retain this information when they publish electronic documents. I'll have more to say in future posts about what information is important to retain, which, at a minimum, should include document structure (titles, sections, paragraphs and other meaningful divisions) as well as references to other documents (statutes, Constitutional provisions, court decisions, etc.). This does not even touch on the meaning of the documents, but at least makes it possible to more easily navigate electronic documents. 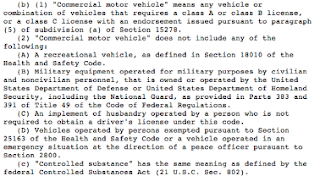 As a motivation for my next (technical) post on how to recover some of this information from existing plain text legislation using a variety of open source Linux utilities, Perl packages and Python functions, I'll take a look at a section from California's legislation. 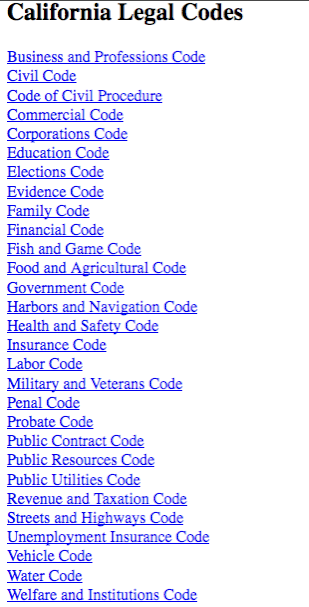 California's legislation is divided into 29 codes, which can be searched from this quaint official web site from California's Legislature. 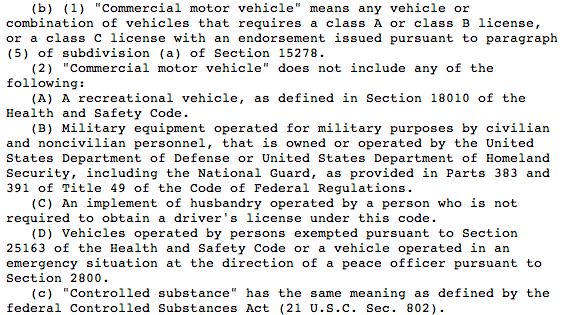 The statutes themselves are posted in plain text, so a visitor to the site has to do repeated searches in order to assemble all of the references necessary to make sense of any given section of the Code. years of the date of operation of that vehicle. As a final note: The major legal publishers (WestLaw, LexisNexis) provide this kind of link information in their commercial databases for lawyers. And Cornell's LII has added links to navigate between references on the LII version of the Code, a major step forward for public access. But even better will be when Congress (and eventually the states) includes these reference links when they first publish legislation. Another reason why this announcement is significant. James Turk at the Sunlight Foundation announced important progress today in their Open States Project, to make state legislative information available in e-friendly formats. They have now brought on line data from New York and Hawaii, bringing their total to 25 states and well on the way to their goal of making all state legislative information available through Open States by 2012. Open States is an open source collaboration, primarily of programmers, and I've been watching their work for a while now. Our efforts at Tabulaw in the legislative arena are focused on converting existing statutes and laws into e-friendly formats and providing an accessible user interface for this information. It will be powerful to cross-link the data on bills and legislative proposals that Open States collects with already enacted state legislation, to show how the proposals would change existing law, and what impact the proposals will have. Congratulations to Sunlight and the Open States team on this milestone!